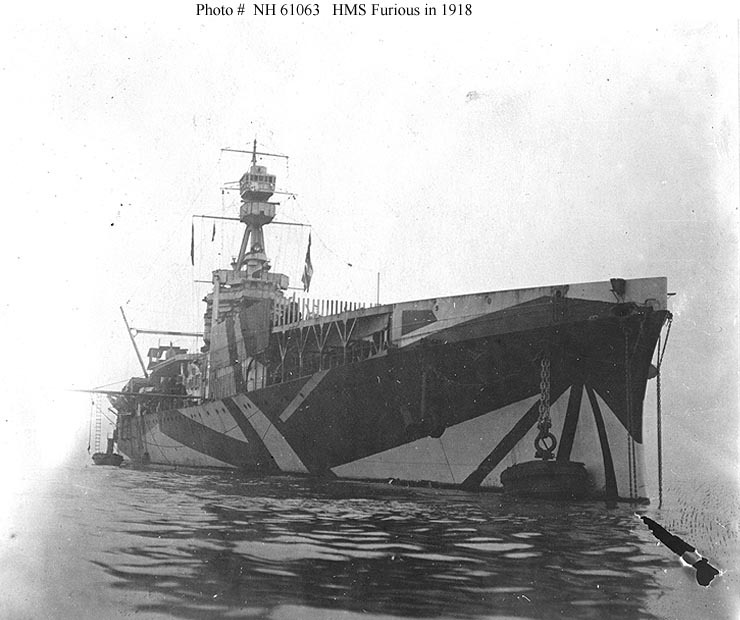 Pictures of HMS Furious as she was configured from March 1918 with the addition of the landing deck aft. I have specifically chosen pictures of this version of Furious because this was when W.A. 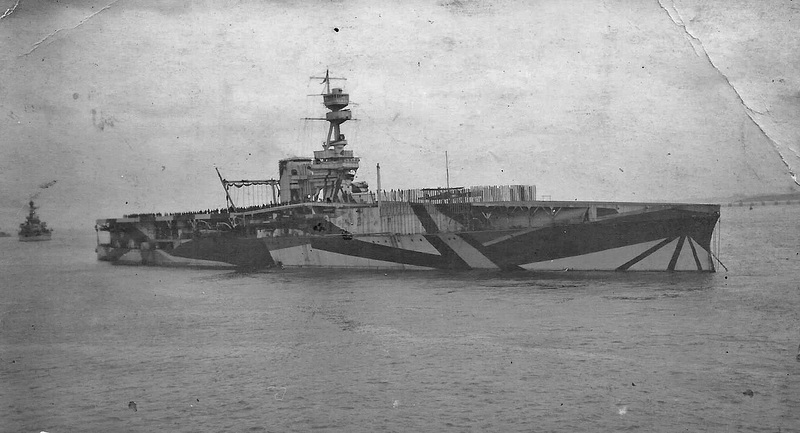 Yeulett served aboard her. I have not done a complete history of the vessel because there is little that I can add to the adequate coverage found elsewhere on the internet. Most of these additonal pictures were found in the public domain and are not believed to have copyright on them. If I am wrong then please contact me and I will take the necessary action. This is a scan of a postcard found loose in my great uncle's photograph album published by prolific naval postcard printers Abrahams of Devonport, card number 904. It's entitled "The 'Mystery Ship' Furious " and includes the shot top-left of "The old HMS Furious". I am not sure of the publication date of this postcard but the text on it (see below) refers to the War in the past tense so I feel it may have been bought after Yeulett's death. There is no writing on the reverse of the card. 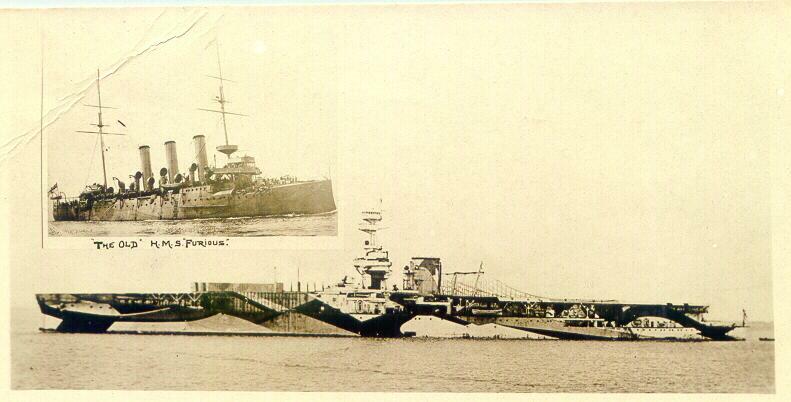 The text on the front of the postcard reads: "This huge light-draught armoured Cruiser with a speed of over 30 Knots once carried 18-in guns but during the War she was converted into a floating aerodrome and aeroplanes can go up from her or land on her vast platforms. The extraordinary "camouflage" painting makes her difficult to be seen by the enemy." 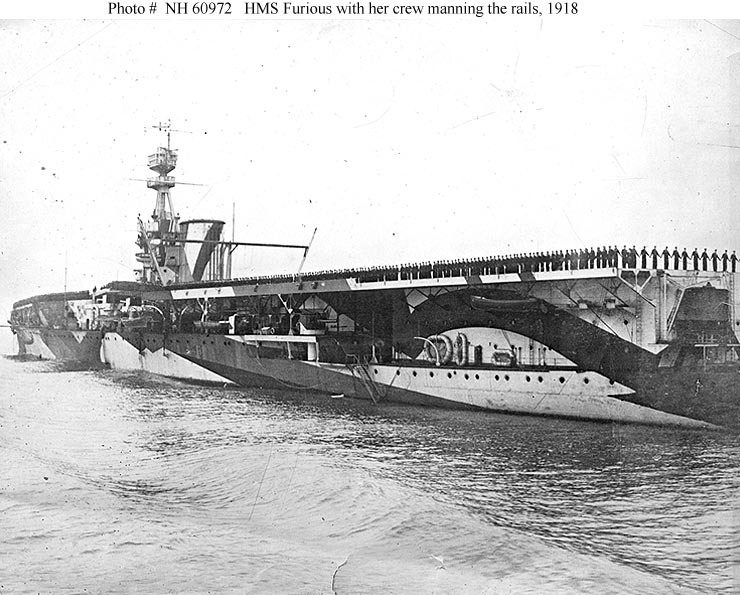 Prior to the configuration of decks featured on this page Furious had been fitted with just the take-off deck forward and retaining her 18-inch gun turret aft. 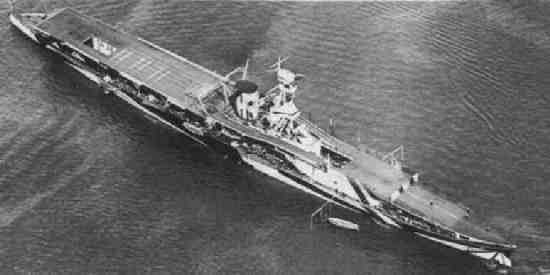 Here is an external link to the IWM in that configuration and is one of very few pictures I've seen of her with one aircraft deck. Link to IWM here. 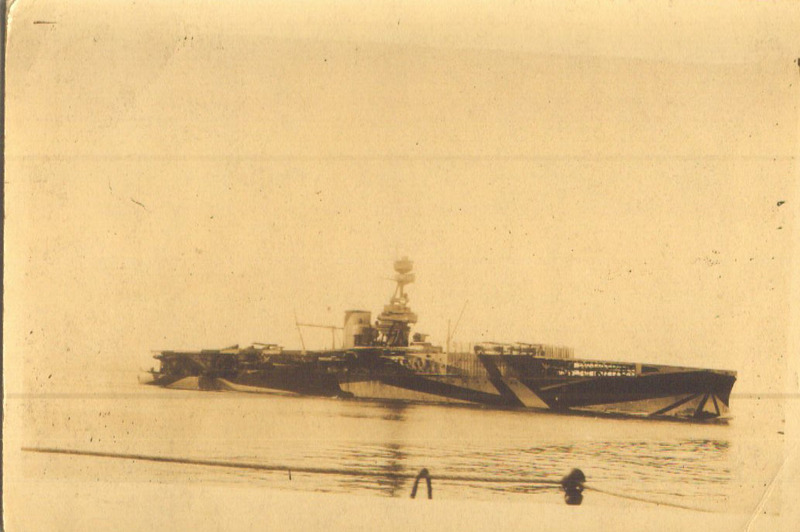 In this one taken in Scapa Flow in 1918 you can see the ramps which ran around the superstructure to enable the movement of aircraft, with folded wings, from one deck to the other. Also visible are the accesses to the hangar decks below. This excellent one was recently sent to me by Ian Burns (from another collection) and gives some scale to the foredeck with an aircraft sitting behind the pallisades. 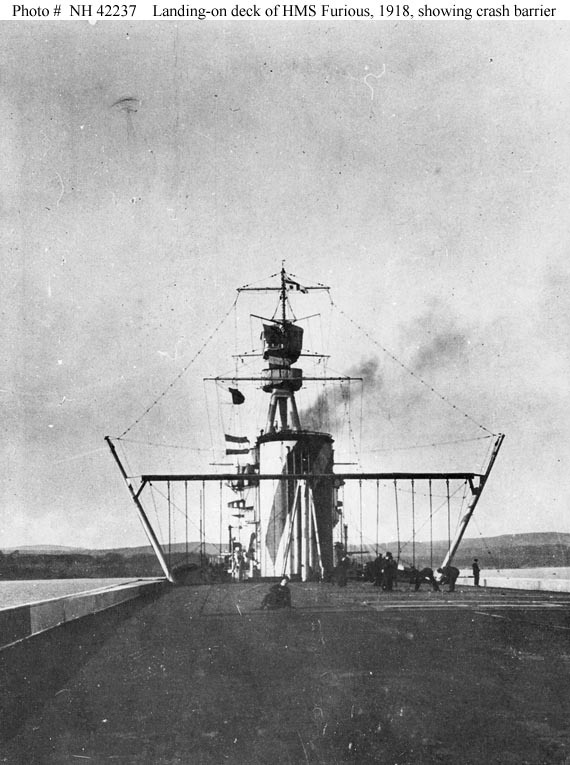 The landing deck on HMS Furious featuring the barrier behind the funnel & superstructure to stop landing aircraft crashing into them. You can also see the ramp leading up to the barrier behind which were the mountings for the longitudinal arrestor wires.